While it is a rare event, every now and then a game will sneak up on you and deliver a level and measure of entertainment and fun you are not expecting. When the game that does this also tricks you by first appearing to be one sort of game, and then turning out to be a different sort of game entirely, well, that is just awesome. 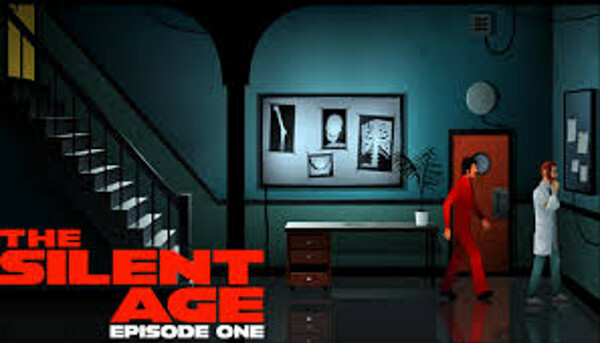 The Silent Age is just such a game... Its premise is simple but not simple: it is a game about an average guy - literally Joe Average - who works a blue-collar grind of a job in janitorial services in an office building that turns out to belong to a National Security Agency. The game actually picks up with Joe at yet another typical day in the grind - except that this day that started with every expectation of being just another day turns out to be THE day. You know, the day that changes everything? You see Joe is not a secret agent. He doesn't have Walter Mitty fantasies (as far as we know anyway) but rather his fantasies are more down-to-earth, being the sort of lifestyle-change type that we all have. You see, at the other end of the blood trail is a strange man who is on his way to being dead - but before he dies he asks Joe to deliver a message. A message to his current and younger self. You see the dying stranger is a time traveler, and in addition to the message he gives to be passed on about saving the future, he also ponies up the portable time-travel device that made his trip (and basically his death) happen. That is almost where the story begins. Except it really isn't where the story begins because this game and the game wizards that made it are pretty upfront about it being a vehicle with a revenue stream. Specifically and before any action starts at all you tap the screen once to “Use the headphones” and then you are confronted by a choice: Tap the Free Episode Icon, or pay $4.99 to unlock the Paid Episode Icon. Either choice you make is going to take you into the first part of the game, which is slickly rendered and interesting. The pre-chapter one game play begins with a brief tutorial that does an OK job of showing you how the game is played. With that out of the way, you get a year-by-year dose of the dead-end jobs Joe has had - from painting ships to being a soldier to being a paid sign bearer - until finally you have your exciting career in janitorial services! 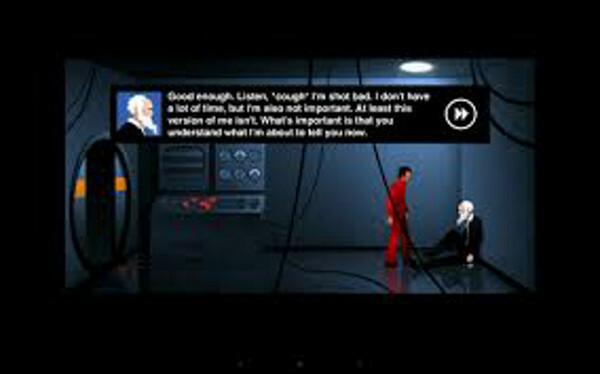 Despite being a graphical game what it really is is an interesting twist on retro classic adventure games of the early 1980s. The second you tap the elevator and read that you need a Red Access Card that should - if you are an older gamer - trigger lots of good memories of the days when games were games and... Yeah. The focus of game play here is a common-sense approach to problem solving and puzzles - the player is not expected to look for unlikely or unrealistic solutions, rather they are expected to look to obvious ones - and that actually makes it more interesting and fun because it is so unusual an approach. Your path forward requires a bit of exploring - and the changing of a light bulb - but once you do that and learn how to interact with and explore the environment, things get more interesting. Game play is really about solving problems and figuring out the way that things work in a puzzling world - but that is the strength here. The game is not supported by ads and with the exception of the very obvious purchase option (you see that each time you play and when you start a new chapter) it is pretty much a what-you-see-is-what-you-get proposition. The graphics are a mixture of colorful painted background and crude animation - but they get the job done! When that is combined with the sound effects and a rather commercial background rumble of the air handlers, it definitely sets the stage and reinforces precisely where Joe fits into the grand scheme of things. You know how often times a review will say that the city or the environment is almost a character in the game (or outright claim it is)? Yeah well the thing is, in The Silent Age it actually is. While the free side of the game is fascinating enough to get you hooked, it is fair to say that it is about more than just playing the game - it is about making you interested enough to spend $4.99 to get to the rest of the adventure - which it does very well. 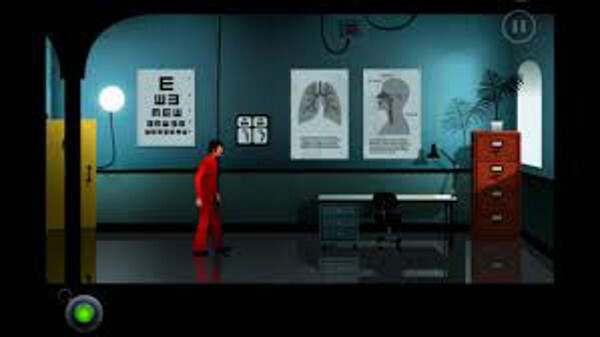 With most mobile app/games weighing in at around $1.99 the price of admission for The Silent Age may seem a little steep but for what you get in return - an interesting adventure that includes spies, time travel, and a lot of figuring your way forward, it might be seen as something of a bargain really. 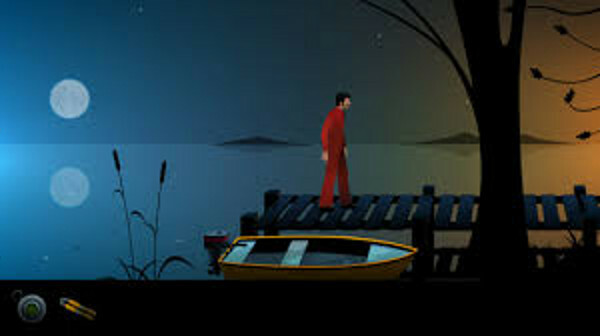 Created by game development studio House of Fire, The Silent Age sends you on an adventure that starts out in 1971 and ends up in 2011, takes you from a repressed world to a distopian one, and lets you be the hero all for a paltry $4.99 admission price. We give that entertaining adventure two-thumbs-up!